The SAFE DRIVE TEST DRIVE: Young Driver Safety Program is a special one-day Defensive driver awareness course aimed at young and novice drivers. The program commenced in Brisbane in 1996 (formerly known as the Quest Safe Drive 2000) and has educated over 58,000 drivers. 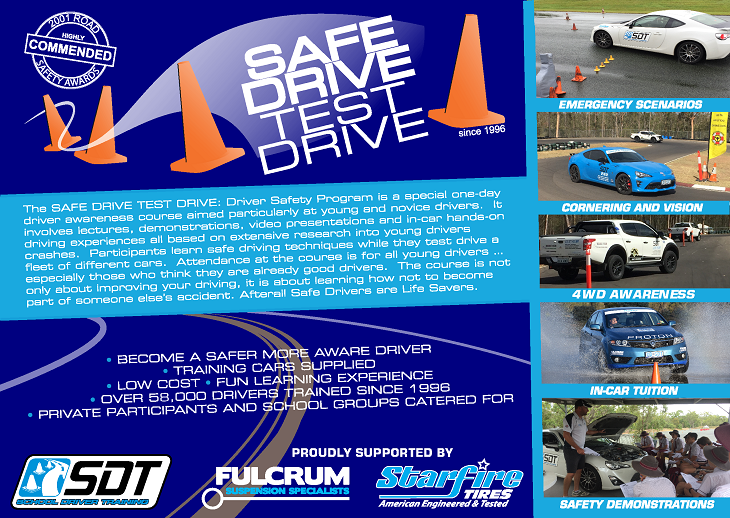 The Safe Drive Test Drive program is offered annually to over High Schools throughout Queensland and New South Wales. School groups pre-book an attendance date. The following information is provided for school groups planning to attend. Why invest in more driver training? Worldwide road crashes kill 1.2 million people per year (3242 per day) and injure or disable up to 50 million people annually, with young drivers on P-plates being over-represented in these crash statistics. Therefore if there is one certainty in life, it is that young drivers are accidents looking for a place to happen. As part of our commitment to improve the driver education of young novice drivers, Safe Drive Training commenced High School based driver education programs in South-east Queensland schools in 1996 (the program was originally known as the Quest Safe Drive 2000). Since then our experience in training over 58,000 novice drivers has unlocked the secrets, to reduce the risks for young drivers. Unlike other driver training programs this course is based on best-practice methodology to reduce over-confidence and risk taking in participants by showing them the limits of their ability and the limits of a vehicle. Unlike other driver training programs this course changes learned behaviour and habits using "Right-way: Wrong-way" teaching principles. What is the REAL FATAL 4? Safe Drive Training developed the Real Fatal 4 Factors in Novice Driver Crashes in 1999. 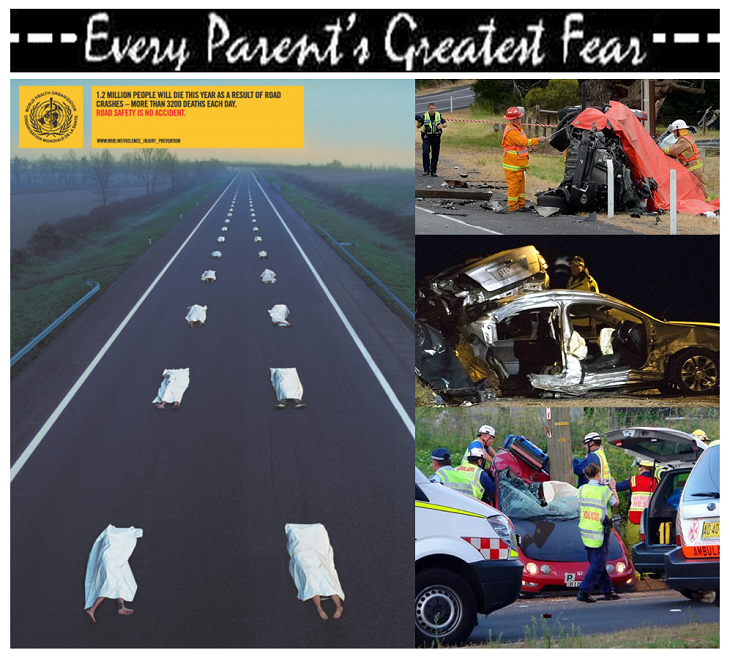 It is our belief these 4 factors are the underlying reason why so many novice drivers are killed on Australian roads. Whilst certain vehicle control skills might assist in the seconds before an impact, the Real Fatal 4 Factors are behaviours which create the dangerous situation in the first place. Empowering novice drivers to understand these factors can assist with better decisions minutes (not seconds) before the potential crash. How do schools enrol in the Safe Drive Test Drive Course? 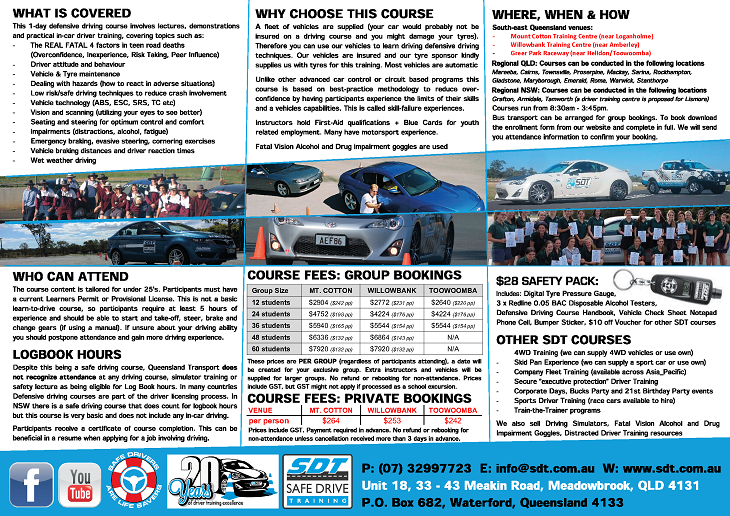 At least 2 months before the course date, Safe Drive Training will send your school an enrolment kit, which includes stocks of brochures and enrolment forms for students to review. Students from participating schools should return the enrolment form and full payment to the course coordinator at your school (unless instructed otherwise). Does the course count towards logbook hours? 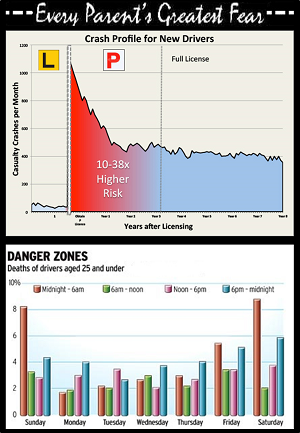 Amazingly, Queensland Transport does not recognize attendance at any defensive/advanced driving courses as counting towards the 100 hours of logbook experience required by L-plate drivers. Therefore the hours of essential driving theory and practical skills training undertaken at this course cannot be credited towards your logbook hours. Participants at this course will be asked to sign a petition to change this decision. Students are invited to purchase a Safety Pack as an optional extra. The Safe Driving Pledge is a committment to safe driving that a novice driver can make to their parent's. 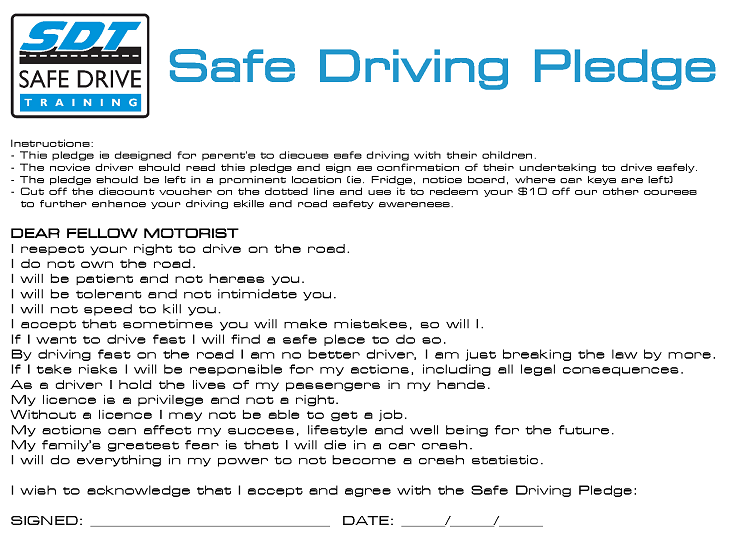 This document can be downloaded, discussed, enacted and placed in a visible location to remind the novice driver of the pledge they have made. Check out the many testimonials from parents, teachers and novice drivers. 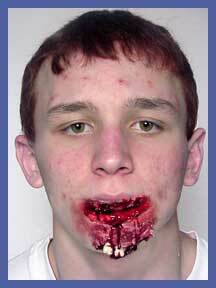 This course has been creditted with saving many lives. Most participants believe this course should be compulsory! Certificate of Attendance: All participants will receive a quality Certificate of Course Completion for display in their portfolio. Many of Australia’s largest companies now require staff to undertake Defensive Driving Courses as part of their employment. As such this certificate may be beneficial to participants when applying for a job position especially if driving is involved. Participants can also show certificates when renewing car/life/medical insurance as rebates or discounts are available from certain insurance companies. We are so confident that our driver training course will make better drivers, we GUARANTEE IT. Research has shown that the training methodology adopted by some advanced (post-licence) driving schools is flawed. The courses introduce advanced/motor sport car control skills without addressing behavioral and attitudinal changes in those gaining these skills. This in turn can produce drivers with greater confidence who readily accept more risk; possibly leading to an increased level of crash involvement for course participants. All Safe Drive Training courses are based on proven worlds best practice training techniques to ensure participants improve their driving safety and ultimately become the best driver they can be.